1. The words to the doleful carol In The Bleak Midwinter were written in London. Christina Rossetti penned the verse around 1872, probably at her home in Torrington Square, Bloomsbury. Her words were later set to music by no lesser figure than fellow Londoner Gustav Holst. 2. Live in Camden Town? Then you're a possible neighbour to Bob Cratchit and Tiny Tim from A Christmas Carol. Dickens didn't say where in Camden the Cratchits resided, but he may have had Bayham Street in mind. The author lived here briefly as a child. This was a bleak time for the Dickens family, with mounting debts that would lead to the imprisonment of Charles's father. The Cratchit family is likewise poor, relying on a salary from archetypal miser Ebenezer Scrooge. 3. The Christmas cracker was invented in London. Goswell Road confectioner Tom Smith devised the seasonal favourite as far back as the 1840s. His company pioneered all your favourite cracker ingredients: the paper hat, the pointless gift, the lame joke, the faulty banger. A cracker-adorned memorial to the Smith family can be found in Finsbury Square, close to their former factory. You can read the full story in a previous Londonist article. 5. Ever been to the swanky Ham Yard Hotel? The celebrity haunt is built upon the site of the greatest act of charity the city has ever seen. In December 1851 chef Alexis Soyer managed to feed 22,500 vulnerable Londoners from a big marquee in Ham Yard, Soho. 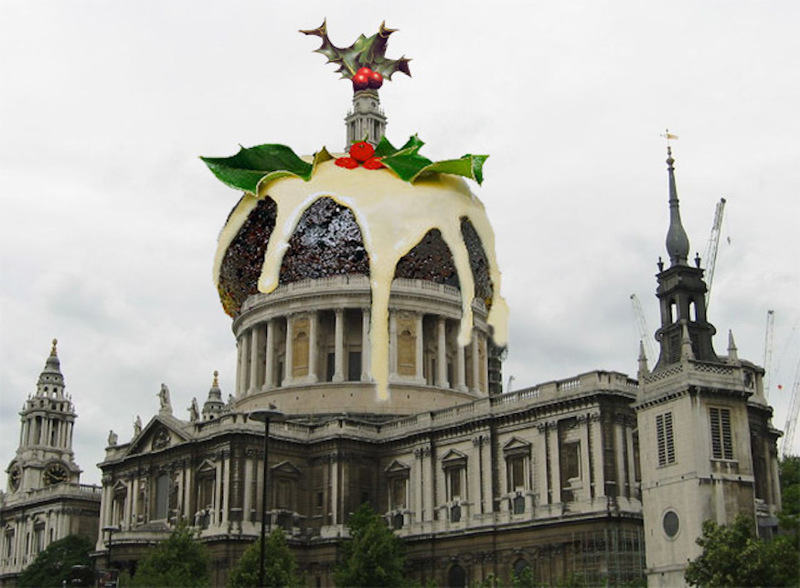 The shopping list included 5,000 pounds of plum pudding, 50 hare pies and 3,000 packets of coffee. Read the full story here. 6. 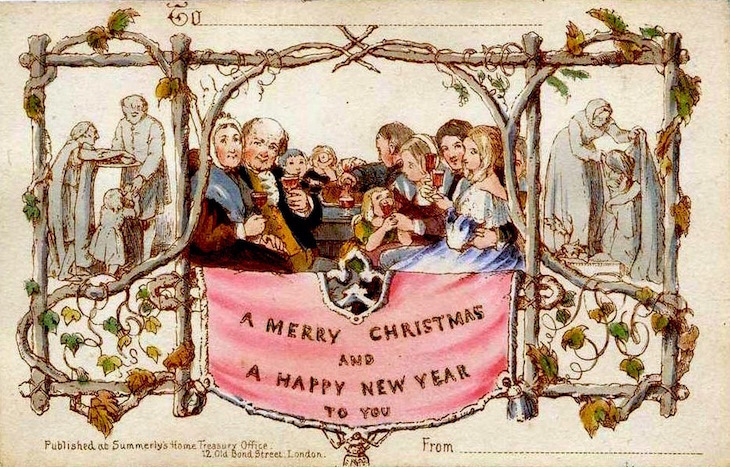 The Christmas fad of 1903? 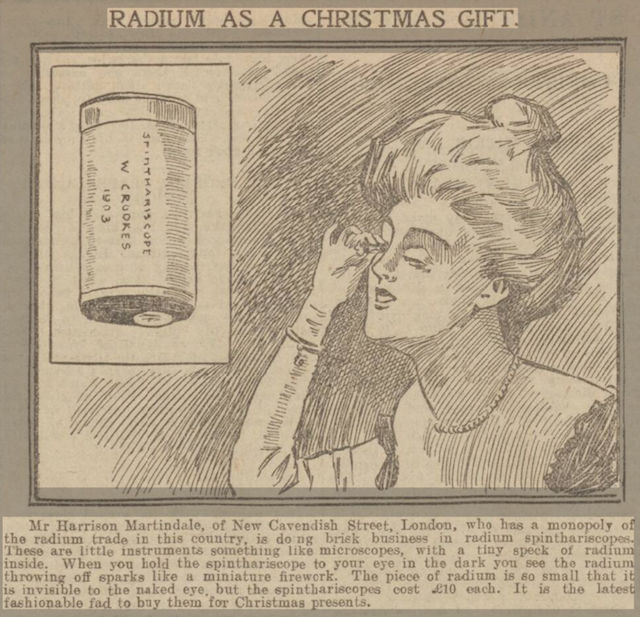 Holding a radioactive substance up to one's eye. (c) The British Library. All Rights Reserved. 7. Cliff Richard was not the first to sing Mistletoe and Wine. The song comes from a 1970s musical version of Hans Christian Andersen's Little Match Girl, first performed at the Orange Tree Theatre in Richmond. The writers intended it to have a satirical edge. It later evolved into a bawdy pub song for the TV version, with Twiggy 'playing the local whore'. A year later, Cliff gave the song a more wholesome, Christian edge — the version we all know and turn off today. 8. The switching-on of the Oxford Street and Regent Street Christmas lights are now firmly established annual traditions, dating back to 1959 and 1948, respectively. Recent years have seen such luminaries as Kylie Minogue and Jim Carrey performing the honours. The illuminations were banned from 1971 to 1977 to save money, returning in 1978 when Prince Charles extended an august digit to light the streets (a planned laser show was cancelled amid fears that children could lose their eyesight). Less obvious switch-flickers include presenter Derek Jameson, disgraced presenter Rolf Harris, ex-footballer and lewd anagram subject David Ginola, Miss World 1981 Pilín León, and the students of Camberwell College of Art.